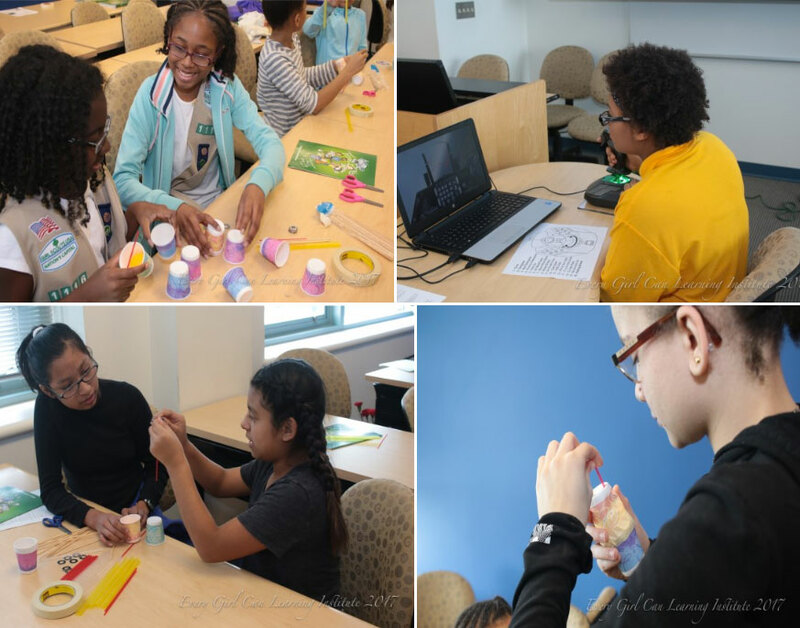 SAVVY STEM GIRL SUMMER CAMP for GIRLS in 6th to 8th GRADE. Please bring your lunch Monday to Thursday. We will provide lunch on Friday. If your child has any food allergy, please provide lunch & snacks, every day. Your Future is STEAMtastic – Explorations in Science, Technology, Engineering, Arts and Mathematics. 7977 Georgia Ave. Silver Spring, MD 20910. FREE for all girls. $20 – Adults. 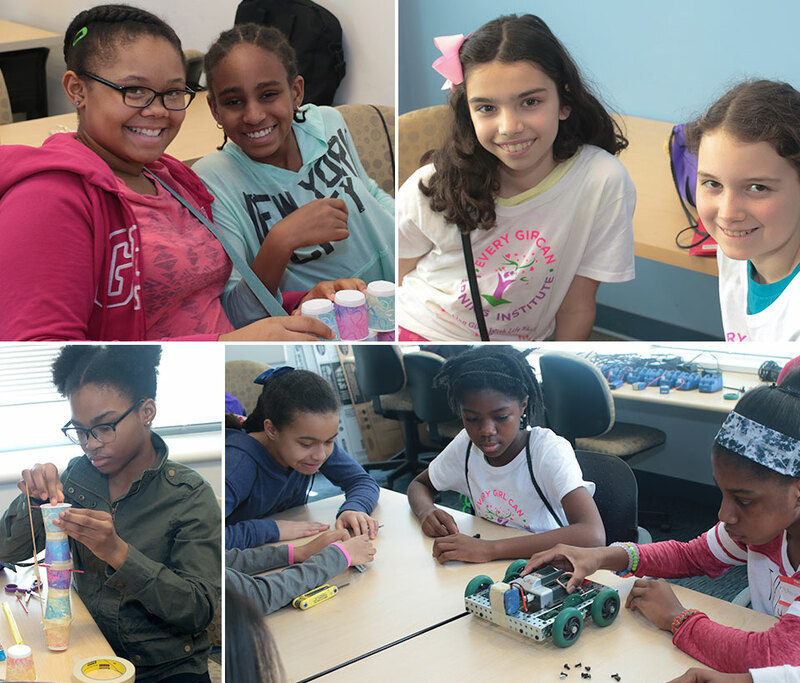 Past attendees of Every Girl Can programs in 9th to 12th grade may register for a special STEAM workshop for high school students and volunteer as conference aides. FREE. Girls: Engage in hands-on workshop, discussion groups & interactive exhibits; Meet STEM/STEAM professionals up close; Explore academic and career opportunities, challenges and trends in STEM/STEAM; Gain knowledge and insights from keynote speaker Dr. Karen Marongelle, Dir. 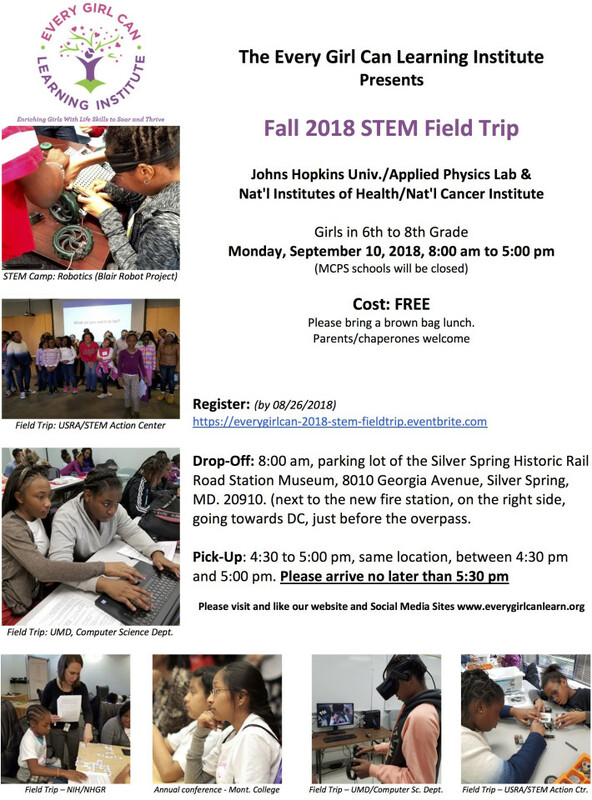 Education & Human Resources, Nat’l Science Foundation and other outstanding presenters from Montgomery College, Johns Hopkins Univ./Applied Physics Lab, Univ. of Maryland, Perspecta,Inc., Dept. of Defense, MCPS, and PGCPS. Women/Adults: Enjoy deep discussion with a panel of STEAM educators and leaders, networking, and our mother-daughter fitness walk, starting at 8:15 am. Bring your lunch or purchase one for $5.00. Complimentary light breakfast. Girls will take home an Every Girl Can T-shirt and other giveaways. 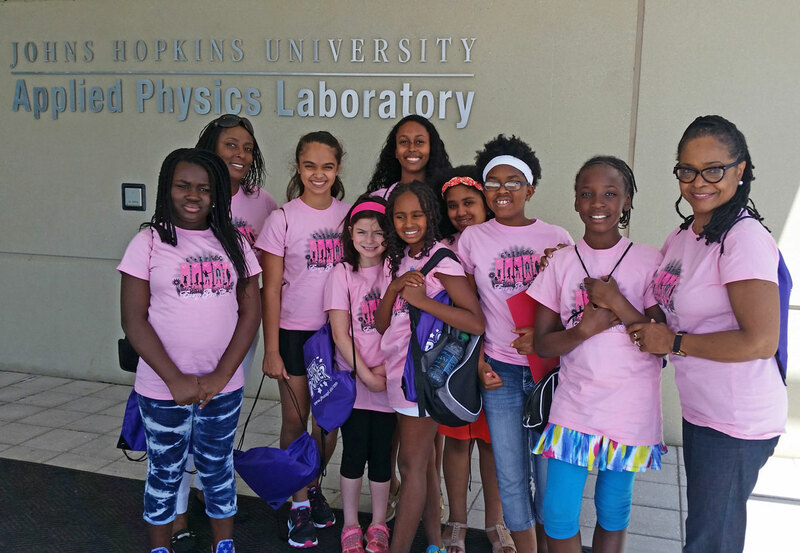 4th Annual Savvy STEM Girl, one-day, camp. Sat. 6/29/19. The Sienna School, Silver Spring. Cost: $20.00. STEAM Summer Camp. July 15-19/19. Cost: $250 – scholarships for qualified students to be announced. Applied Physics Lab and Nat’l Institutes of Health – Nat’l Cancer Inst. ALL ATTENDEES MUST PURCHASE TICKETS IN ADVANCE (FREE OR PAID) then COMPLETE ONE REGISTRATION FORM PER CHILD. SEE LINKS BELOW. 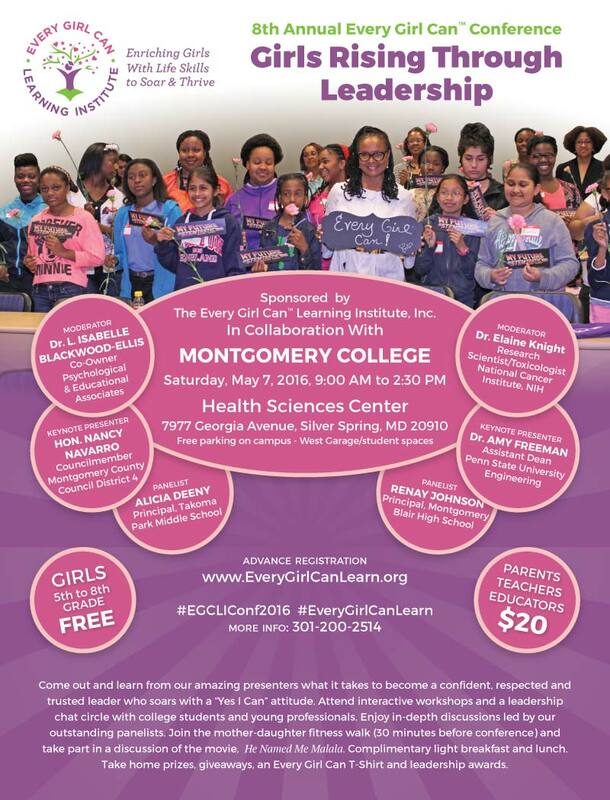 Please join us for the 10th Annual, Every Girl Can Conference for girls and women. Dads welcome. Adults – $30.00 includes box lunch & T-shirt. $25.00- bring your own lunch. Discounts with group registration. Please call for details. We have planned an exciting day of fun and learning to help girls discover what it means to be a leader. 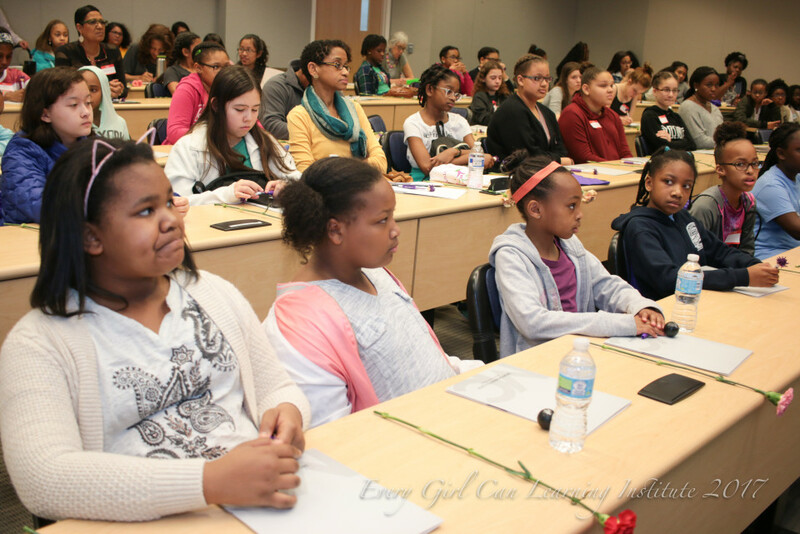 Girls in 9th grade through college/beyond.Are you a former participant of an Every Girl Can program since 2007? Come out and be recognized then join us for a lively discussion on leadership, mentoring and giving back to the community. Our non-profit needs your help to continue making a difference in the lives of girls. Visit the Computer Science Department at University of Maryland, College Park and the headquarters of Universities Space Research Association in Columbia, MD. Drop-off students in parking lot of St. Johns Episcopal Church beginning at 7:30 am. Bus leaves at 8;45 am. 11040 Baltimore Avenue (corner Rt. 1 & Powder Mill Rd.). science, engineering, mathematics and other STEM fields. 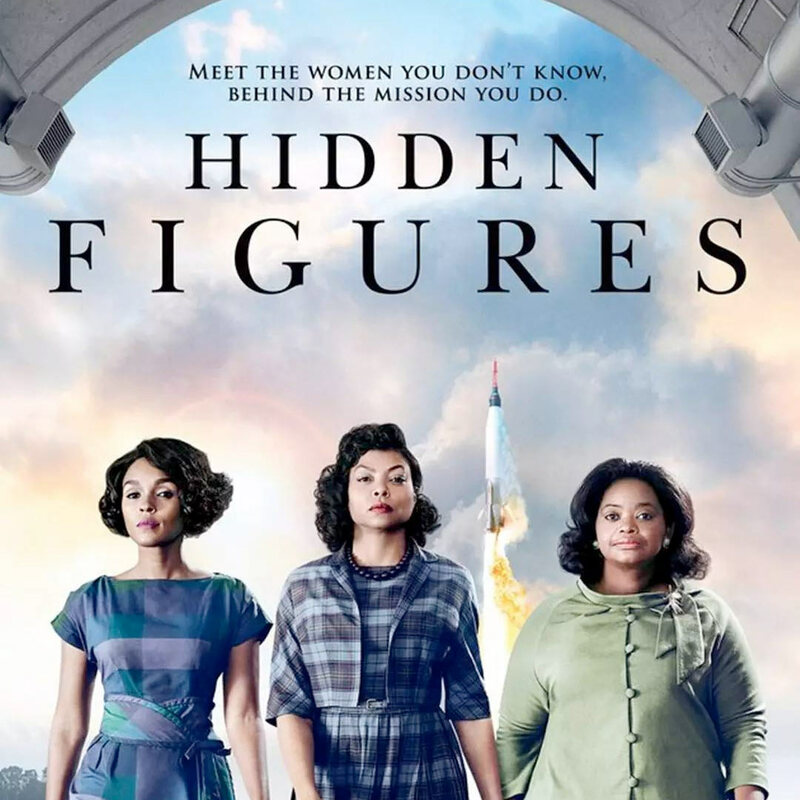 Win a signed copy of the book – Hidden Figures and other prizes. The Every Girl Can™ Learning Institute, Inc. 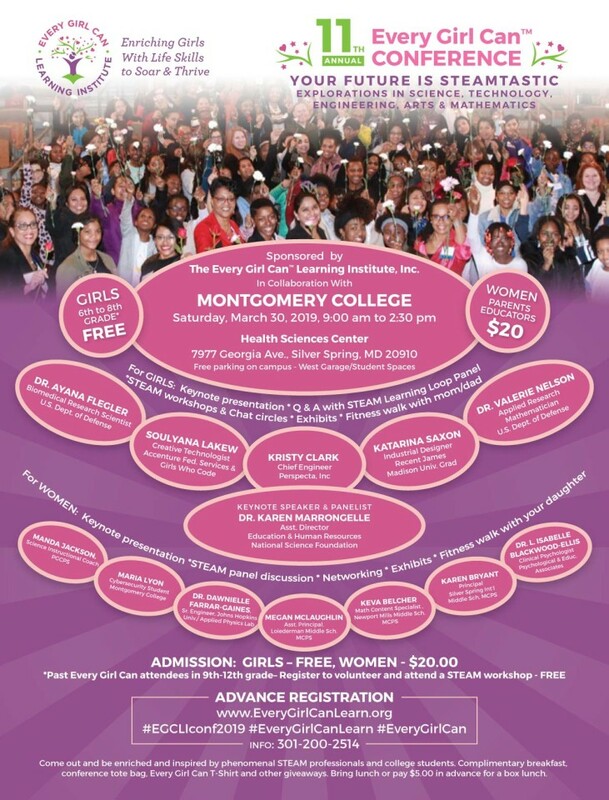 Please join us for a day of fun, hands-on learning, enrichment and inspiration for girls and women. Dads are welcome. Come out and explore, discover and learn how to be confident and succeed inside and outside of school. Meet and talk with phenomenal women who are local and national leaders in the fields of science, human genetics, robotics, education, mathematics, architecture, technology, cyber engineering, performing arts, aerospace, nutrition science, and diabetes research. 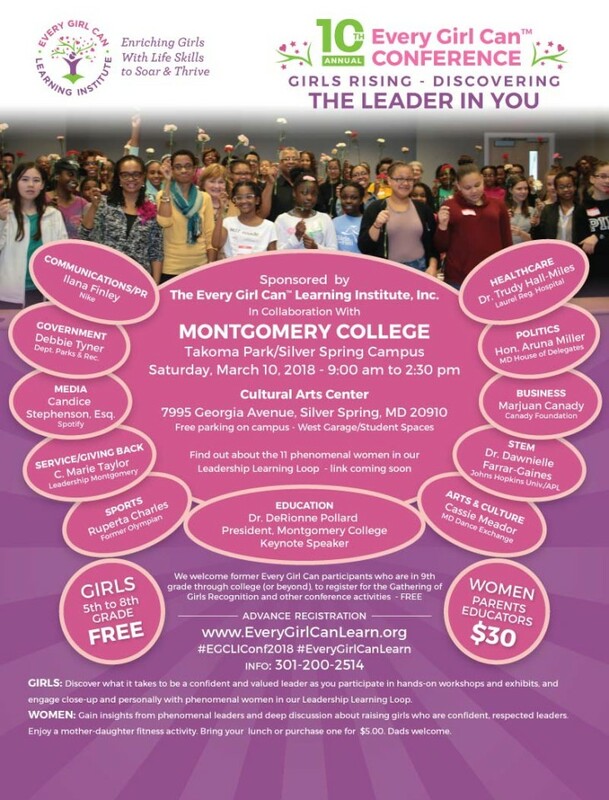 Business and professional women in STEM/STEAM, Montgomery College and Montgomery Blair High School students will contribute to the conference as speakers, panelists, workshop presenters, exhibitors and resource providers. Been to the theatre lately? Enjoy a special STEAM presentation in the Montgomery College Cultural Arts Center. Conference attendees will receive a complimentary light breakfast and lunch and a conference tote bag with giveaways. Sponsors and advertisers are needed to help us cover the cost of the conference. Please click http://bit.ly/DonateEGCLI_17 to check out our online fundraiser or download the sponsor form below. Please register and/or make a tax deductible donation below. 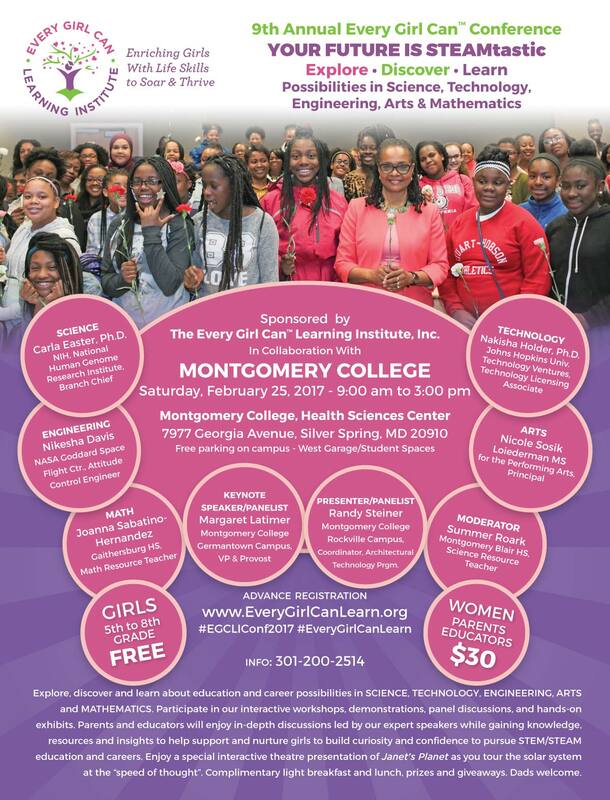 The Every Girl Can Learning Institute is sponsoring a field trip to NIH on Wednesday, October 12th for girls in 6th to 8th grades. We will depart from downtown, Silver Spring by car at 8:45 AM then drive to the NIH campus in Bethesda. Girls should bring a brown bag lunch. We will dine in the NIH cafeteria then return to downtown by 2:00 PM. The cost for the field trip will be $20.00. For parents who need after care, the cost will be $15.00 (from 2:00 PM to 6:30 PM). Please stay tuned for the registration form on our website. If your child will participate in the field trip, please let me know ASAP if you will need aftercare. Girls should wear the white EGCLI. Please RSVP by email to yasmin@everygirlcanlearn.org. The National Institutes of Health (NIH) is the nation’s medical research agency — making important discoveries that improve health and save lives. The NIH is made up of 27 different sections called Institutes and Centers (ICs). Each has its own specific research focus, often related to a particular diseases or body systems. 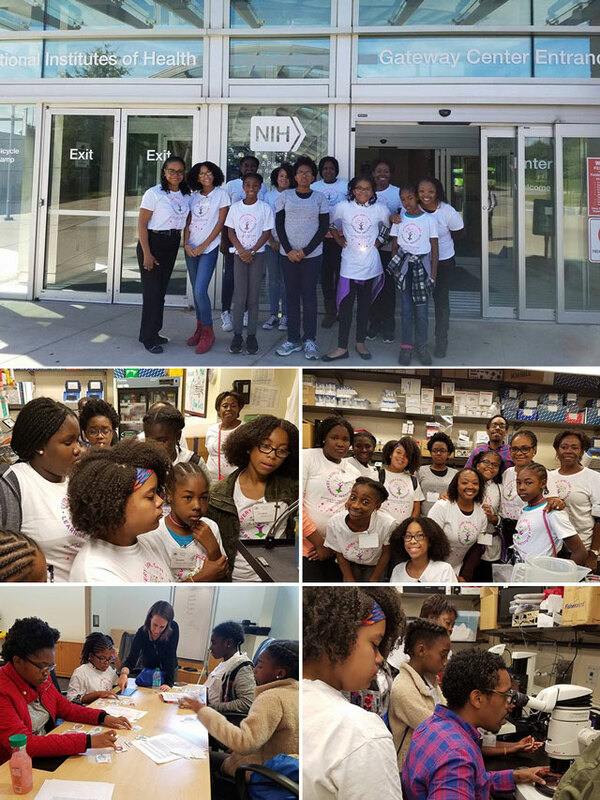 During the visit, the young ladies will have an opportunity to learn more about NIH and its role in keeping the nation and the world healthy; visit one of the laboratory facilities that supports the research of the thousands of scientists who work at the NIH; and meet with some of the researchers who support the NIH’s research activities.